King cake is a Mardi Gras tradition dating back many years. Filled with cinnamon sugar, Pecan praline or cream cheese filling it has come to symbolize the whole Mardi Gras experience. 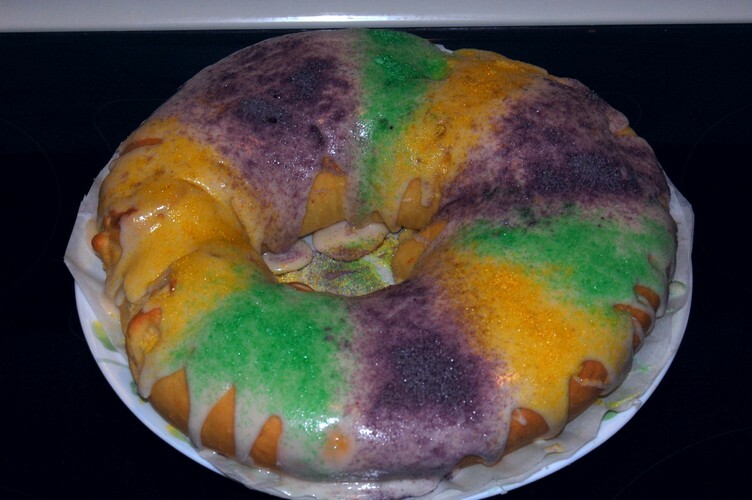 The colors on the cake represent Faith (Purple), Justice (Green) and Power (Gold), meanings they were given in 1872 by "Rex" king of Mardi Gras. You may be wondering why I decided to name this Jacksonville King Cake... isn't king cake a New Orleans tradition? Yes, but I decided to give it a twist and replace the lemon peel in the recipe with orange peel. If you really want to keep it traditional then just stick with lemon peel where I use orange peel. Mix all ingredients for sponge and set aside in a warm place until bubbly. Add remaining ingredients and mix until blended. Turn out onto a floured board and knead until smooth and elastic, adding a dusting of flour as necessary. Place dough in an oiled bowl and keep in warm place until doubled in size. Make the filling by beating ingredients together until fluffy. Turn dough onto lightly floured surface and roll into a rectangle. Spread cream cheese filling evenly then roll up the dough lengthwise like a jelly roll. Pinch closed, then form a ring and pinch ends closed. Place on a baking sheet lined with parchment and let rise 45 mins. Pre-heat oven to 375° and bake cake for 20 mins until done. Remove and let cool completely. Mix icing together and whisk until smooth, you may have to add a little more milk to get a consistency that can be drizzled. Drizzle over cake and then decorate with colored sugar before icing dries. Colored sugar can be easily made using a small Tupperware container, some sugar and food coloring. To 1/4C sugar add 5 drops yellow (gold), or 4 drops green & 1 drop yellow (green) or 2 drops blue & 3 drops red (purple). 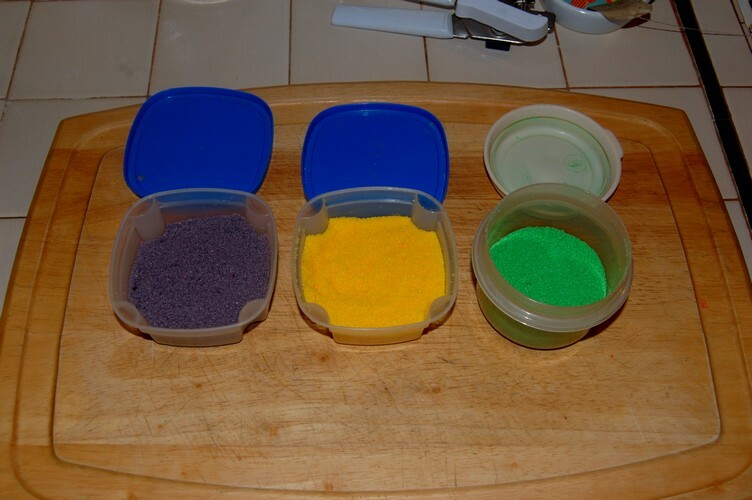 Combine sugar and the food coloring needed for whatever color you're making. Seal container and shake, Shake, SHAKE until the color is evenly blended. Allow containers to dry open overnight.